Dream Pod 9: Kickstarter Update: Shipping Update & New Resin Arm Sets Available! We added an extra helper at the office last week to help with packing up armies and backer rewards, welcome Alisha to the team. If you want to read the full Kickstarter Update with images of Alisha, Dave, and Robert click the following link. During the Kickstarter we promised that once the plastic sprues were made we would take the time to get some arms sets sculpted to hold the weapons across the torsos. As the nature of the plastic injection molds did not allow for the arm poses needed to do that, except for one test part we tired on the Jager sprue, by removed details the would have caused not to release from the mold. We gave the Hunter, Jaguar, Cheetah, Jager, Black Mamba, and Iguana plastic parts sprues to our sculptor, Phil, a few weeks backs and asked him to do his magic. He took the plastic arm parts, chopped them up and reposed them so the right arm can hold the weapon across the front of the torso and he straightened the left arm and made a new open flat hand pose to cradle the weapon. Then silicon production molds were made of the parts for casting in resin, so arms will be as light weight as possible, to use on the new plastic miniatures. We received the first sets of custom resin arms on Friday from Fusion Models, who are making the production molds and doing the casting for us. 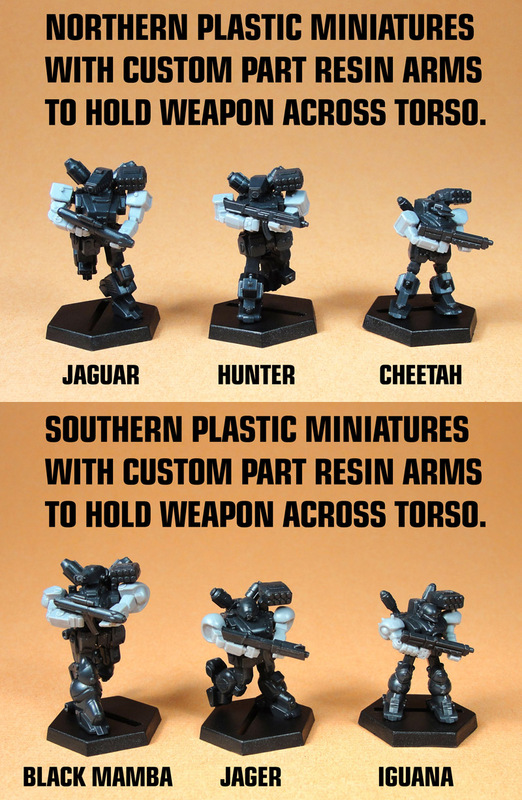 I took the time on Saturday to assemble the plastic Hunter, Jaguar, Cheetah, Jager, Black Mamba, and Iguana models with stock loadout and the new custom arms holding the weapon across the torso and took some photos attached with this post to show how they look. The 6 sets of custom resin arms are now available to purchase ($2.00 USD each) on the Dream Pod 9 Online Store at the following link for those interested. Home › Blogs › Robert Dubois's blog › Kickstarter Update: Shipping Update & New Resin Arm Sets Available!